Alternanthera reineckii is a very appealing long-stalked plant with the leaves which color varies from rose-red to dark-violet. Its shoots trailing along the water surface can be quite long. 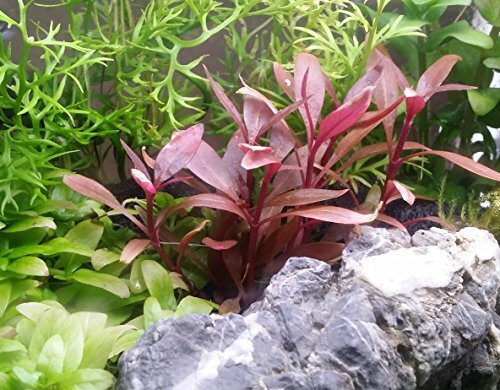 The plant looks great as part of various aquascapes and as a rule it is used as a focusing point. In its habitat Alternanthera reineckii and its dwarf form called ‘mini’ grow as a paludal plants, but under the conditions of mild climate they are grown only in tanks. Alternanthera is a plant from amaranth family. Its name comes from Latin ‘alternans’ which means “changeable”. This kind numbers about 170 species of annual and plurannual herbaceous and suffruticous plants. They come form tropical and subtropical areas of Africa as well as from Galapagos Islands, Asia, Australia. Many kinds of the plant are cultivated by gardeners in their backyards, some are used as aquatic plants in ponds. Alternanthera reineckii comes from South Brazil and Paraguay, where it grows as a paludal plant which is well adapted to a long-term living over water. This kind is the most enduring one and it is easily cultivated under water. For many years A. reineckii has been a perfect decoration used in natural tanks. In the wild this plant belongs to the species which dwell in flooded areas for a long time. These can be flooded fields covered with trailing stems having their top above the water. The plant has oval-shaped stalkless leaves which are decussate (each next pair of leaves is perpendicular to the previous one). The leaves are 2.5-3.5 cm long and 0.5-1.5 cm wide. Their upper side is green and the down side is pink or red. In summer small stalkless green-yellow or pinkish flowers appear in the leaf sinuses. The plant has fibrous root system which grows prolifically. The roots are thin and long, they have filamentary structure. Under water the plant stem grows vertically and if a tank isn’t deep, the plant quickly gets out of the water. These emergent shoots are used to adapt the plant for growing on the ground. If you put them under water again, they will shed their leaves. This plant also has a dwarf form called Alternanthera reineckii ‘Mini’, which has brown tinted color and grows not more than 20 cm high. When describing this plant we should mention its unusual phylotaxy. The distance between the leaves is very small, which makes them look fluffy. A lot of off-shoots grow from parent plant, that’s why gradually expanding Alternanthera reineckii ‘Mini’ forms a large carpet. The shoots grow slowly and they need 2 months to develop. Less Maintenance for plant roots cleans water, and live plants competes algae build up. Adds tranquility in your home as you gaze and soothes your eyes. Give natural hiding place and food for the fish & shrimp too. In a tank Alternanthera reineckii is planted in the middle distance or around the sides of the tank. It should not be put very thickly, since the plant is rather fragile. Under water the plant stems grow perpendicularly and quickly reach the water surface; in small tanks (up to 10 inches high) the plant grows above the water and develops its leaves there. In this case leaves that are under water are no longer needed and the plant sheds them. That’s why the top of the stem should be timely cut off, when it reaches the water surface. This will allow not only to preserve the underwater leaves, but also this will make the stem branchy and it will form bushes that change their coloring depending on the environmental conditions. Alternanthera reineckii growth rate is quite high in a tank, about 10-15 cm in a month. It’s better to keep this plant in a tropical tank provided with tank water temperature about 24-28 °С. It will stand temperature decrease up to 20 °С, but at that its growth rate will slow down. Water hardness and its violent reaction don’t play any sufficient part in this case, though it’s desirable to keep Alternanthera reineckii in water with рН value close to 7. The plant requires constant water renew. It grows slower in old water. Alternanthera reineckii needs very bright tank illumination. This is the factor that influences the leaves color and the plant appearance in general. Natural light, especially direct sunlight is very good for this plant. Keep in mind that filament bulbs may burn the shoots that grow above the tank water. Light day for this plant should last not less than 12 hours. Presence of silt on the tank substrate doesn’t affect Alternanthera reineckii much. The plant develops rather small root system near the stem base and it has lots of additional roots in its leaf sinuses. Alternanthera reineckii gets nutritional substances mostly right from the tank water. Type of the tank substrate doesn’t make any significant difference to it, but its root system develops a bit better in large grained sand. Thickness of the substrate layer in a tank may vary, even 2 cm thick layer of sand can be enough for the plant to grow successfully. Mineral feed is very helpful when the plant grows fast. During this time it should get enough nitrogenous matter and mineral nutrients. It is crucial to add ferrum and kalium into the tank water. In simulated conditions Alternanthera reineckii demonstrates successful vegetative reproduction by cutting. You can divide its stem into pieces, each of which should have 4-5 leaf whorls. If you leave such sprigs to float on the water surface, they will soon develop roots and then you can plant them into the substrate. However, you don’t have to do this right away, since the plant can grow as a floating one for some period of time.